A brief biography…or a biography of briefs……? 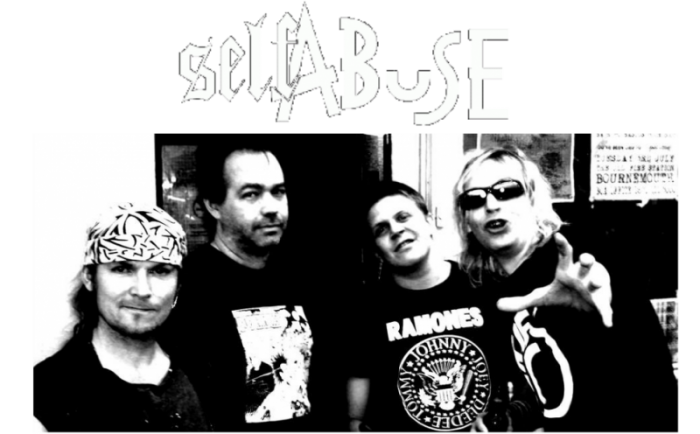 Self Abuse formed in Bournemouth, Dorset in 1982. Andy Nazer (vocals / bass), Dave Brown (guitar / vocals), Roger ‘Jarvis’ Smale (guitar), Steve Ridgeway (drums)…age 16/17 respectively. Played their first gig in Poole, Dorset and released the ‘State of Mind’ demo cassette on their own Abused label during that year. 1983 saw them record and release the ‘Teenage’ demo (again on their own label) and play across the south of England with Subhumans, A-Heads, Cult Maniax, Screaming Dead, Cult Maniax, Butcher, A-Heads, Amebix, Admass, Organised Chaos, Madmass, Last Orders, Confession of Sin, Idiom Tribe, Shrapnel, The Samples, Screaming Dead, Shock to the System, Breakout, , Atrox, The Parasites, amongst others. Sound-wise the band were described by fanzines as being a cross between Stiff Little Fingers and Chron Gen. In 1984 the ‘(I Didn’t Wanna Be A) Soldier’ EP was released by the Radical Change label, the late great John Peel played it on his radio show and the record got to number two in the Independent charts. Two tracks from their ‘Third’ demo were featured on the Punk compilation ‘Party Pooping Punk Provocations’ released by Xcentric Noise records late in 1984.The band split after a Christmas gig in Bournemouth that year. 20 years later in 2004, the original line up reformed to play a gig in Bournemouth and released the ‘No Change’ 7” EP on Abused records and the next year saw them play the Wasted Festival [now Rebellion Festival] in Blackpool, and support Subhumans, Anti Nowhere League, Stiff Little Fingers, the Vibrators at various south coast gigs. Grand Theft Audio records from the USA rounded up the bands original demos and EP and released the ‘(I Didn’t Wanna Be A) Soldier’ CD in 2005. In 2007 the band released the ‘Celebrity Death Squad’ 7” EP, again on Abused and Dom ‘Upchuck’ Webb replaced Steve Ridgeway on drums.